Located just six miles north and east of Boston, Arlington, Massachusetts is the home of Paul Revere’s famous midnight ride. Playing a large role in the American Revolution, this is home to just over 40,000 residents. Bordering the Mystic Lakes and Mystic River, this Massachusetts town invites visitors to enjoy the beauty of the great outdoors. From hiking to rafting to skiing, Arlington is known for its gorgeous backdrops and incredible outdoor activities. When a dental emergency strikes, Arlington is also home to a large selection of great emergency dentists. The Emergencydentistsusa.com website is an excellent place to begin your search for your new Arlington emergency dentist. Our convenient listing of local dentists is right at your fingertips with all of the information that you need to make a good decision about your dental care. From driving directions to office specialties and hours of operation, all you have to do is click on the dental clinic that interests you and learn all that you need to know to select a new Arlington emergency dentist. When you do not have access to the internet or need a little more help choosing a new dentist, our dentist finder hotline is ready and waiting for your call. Operating toll-free and open 24-hours a day, the dentist finder hotline connects you with a friendly agent who can give you all of the information that you require to select a dentist. Our agents can even set up your first dental appointment for you. Remember to bring your photo identification card, your dental insurance card, and your dental insurance copayment with you to your first dental visit. Arrive at least 10-15 minutes early to ensure that you have plenty of time to fill out your new patient paperwork. It is wonderful to have a variety of dental choices available to you when you live in or visit Arlington. There are dental clinics that offer orthodontics, cosmetic dentistry, implants, and even simple routine care located in this lovely Massachusetts town. Choose general dentist to get started on your dental journey today. Description: Welcoming walk-in patients is a wonderful reason to choose Arlington Dental Care. From general dentistry that includes routine cleanings, fillings, and digital x-rays to emergency dental care and full mouth restorations, this full-service dental clinic provides exactly what you need to get out of pain and on the road to recovery. Dr. Kaveti and staff spend one-on-one time with each patient to be sure there is a clear understanding of their treatment plan. Description: With access to implants, veneers, and dental whitening, Arlington Dental Group offers patients plenty of options for excellent dental care. Routine dental x-rays and cleanings are available along with emergency dental services to repair a broken tooth or replace a knocked-out tooth. A caring dental staff and a state-of-the-art office are a great combination when it comes to dental care. Description: Gentle and compassionate care is the priority at New England Family Dental. From routine dental evaluations to more complicated emergency procedures, the kind and caring staff is standing by to provide you with your best dental experience ever. New England Family Dental offers dentures, teeth whitening, general dentistry, implants, and crowns along with a variety of emergency dental procedures. When terrible tooth pain persists for more than an hour or two, it is time to schedule a dental appointment. It is always important to see a health professional before your toothache becomes something more complicated. If you have a dental emergency that stems from an accident like a fall or a car accident, head straight to the local hospital or urgent care center or call 911 immediately to ensure that your accident has not caused more dangerous injuries. An emergency dentist can repair teeth that are broken or damaged in an accident. 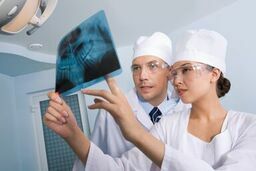 When you choose a new dentist, it is important to check his or her licensing and credentials to make sure that your dentist is certified to practice in Massachusetts. You can use the Massachusetts Dental Association’s website to check current licensing status and get information on your new dentist’s standing. You can also access this information at your first dental visit as most dentists keep these documents on display in the office.